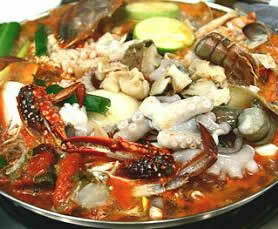 Haemultang or spicy seafood stew is one of Korea's most famous traditional foods, particularly amongst foreigners looking for an authentic dish. Immerse yourself in a spicy but yet sweet, soup-based dish packed with abundant seafood, including but not limited to blue crabs, octopus, lobster tail, squids, scallops, shrimps and clams, all seasoned with gochujang, red pepper paste. The most important characteristic of good Haemultang is its fresh ingredients. The soup can contains various vegetables such as peppers, mushrooms, onions, bean sprouts, dropwort, leaks, crown daisies and much more, supplementing to its spicy, refreshing deep taste. Its combination gives it a rich flavor and an amazing taste that's also excellent for your health. It's definitely known as one of the best savory dish that will surprise your taste buds and make you sweat throughout the entire meal.